After a month and half of trip crossing the Muslim and Buddhist area of the country we went into the Uttarakandh state, which is plenty of forests, hills, water falls and lakes; and where the glacier Gaumukh exists from where the Ganges, the most sacred River in India, is born. There, our first destination was Rishikesh, a famous centre of Hindu pilgrimage. 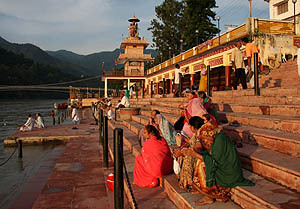 The word Rishikesh which has its origin on the Sanskrit is a name of the God Vishnu that means “Lord of the senses”. The place is a holy city for Hindus, and according to the Indian mythology it obtains its name after Vishnu was appeared to Raibhya Rishi as a result of his austerities, as Lord Rishikesh or Lord of the senses. Raibhya Rishi was an Indian sage who located a temple on the bank of the Ganges. According people explained to me, for the Hinduism God is only one but He has an infinity of manifestations; and among the most important are; “Brahma” the creator God of the universe, “Vishnu” the God of the preservation of the world and “Shiva” the God of the destruction who has as function the destruction of the creation so that everything can be created again. Then through his multiple manifestations other masculine deities exist, as “Krishna” (one of the main incarnations of Vishnu, although according to the vaisnava tradition, Krishna is the Supreme Personality of God) “Hanuman” (the Monkey God who saves of the adversities) or “Surya” (the solar deity who is one of the three main Vedic God). Among the most important feminine deities arise “Parvati” (the love Goddess), “Lakshmi” (the Goddess of wealth, prosperity and fortune) and “Sarasvati” (is the goddess of knowledge, musci and the arts). Contrary to other beliefs more defined, the Hinduism was not founded by any prophet. 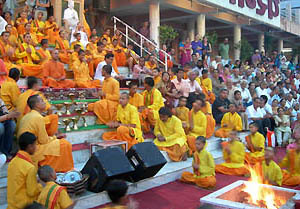 The Hinduism is not a religion neither a philosophy but a sum of them, a group of theoretical and religious beliefs, cults, customs and rituals that conform a tradition, in which it doesn’t exist neither priestly orders that establish an unique dogma, nor a central organization. The Hindus call to this religious tradition “Sanatana Dharma” (eternal religion), because they believe that it doesn’t have principle neither it will have end. The Hindus revere to the divinity in anyone of their manifestations, they are tolerant and they allow that others practice their beliefs, because they believe that all the other religions are just different roads of reaching the same spiritual goal. They believe in a not created principle, eternal, infinite, transcendental that embraces everything and that it is the only reality. It is the last cause, the foundation, the source and at the same time the goal of the whole existence. Thereby they believe that behind the “visible universe” (Maya or illusion), to the one that attribute successive cycles of creation and destruction, there is another eternal existence and without changes. Therefore to abandon the cycle of reincarnations and to return to the spiritual universe constitutes the biggest of all the achievements. Rishikesh that is considered as the world capital of the yoga, got international fame at the end of the 60, when the Beatles visited the place wanting to discover the secrets of the transcendental meditation. Since then they are thousands of people, many arrived from western countries who go to the city in search of a spiritual retirement, attracted by the great quantity of centres ashram and their different yoga courses. 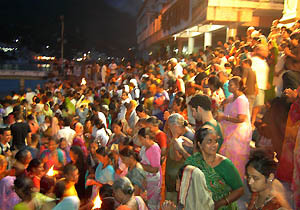 In one of the main Ghats (stairs on the Ganges), when night comes it is carried out the ceremony “Ganga Aarti”, a real show where pilgrims, tourists and sadhus (men who are devoted to the spiritual search) attend. 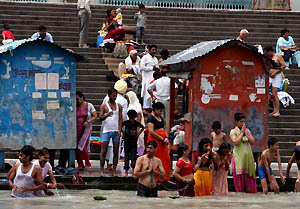 The ritual begins with songs of mantras that glorify to the Ganges River and Shiva, then the faithful ones come closer to the river to leave their offerings what are as small ships of leaves that carry flowers and a candle. The ritual is carried out by several priests, along one hour who first wave the fire lamps toward the river what supposes that it acquires the power of the deity, and then the priests circulate them toward all the present, blessing them. And it was in Uttarakandh where we started to see the other side of India, perhaps the real one if I compare it with Ladakh, Srinagar or McLeod Ganj. Here everything is more colourful, but also dirtier, sadder and more difficult; because of the overpopulation and its consequences, for the cruellest and unimaginable human deficiencies that one sees day by day in the street and also for the curiosity of those that don’t have treatment with the foreigner. The pee smell is present in everywhere and it is unbearable, in some places there are public bathrooms for men, but for the smell it is deduced that they clean them once per month. One day walking with Clara a man came near her and started to walk to her side too close, as hypnotized, bothering. But I didn’t say anything to him and to avoid troubles we preferred to walk faster; but the guy kept walking so close to Clara, as a bee and as if I was not there. So after few meters, I moved Clara and I faced him angry, and due to we didn’t understand each other for some seconds the situation became tense, but then I preferred to obvious him and it was much better. So getting involved in the daily of the city we didn’t find it so “spiritual”. 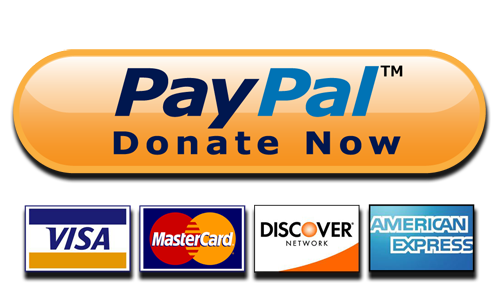 During our stay we were interested in yoga courses but for a class they charged us the same money that we were paying for our room which had private bathroom and balcony to the Ganges. We were also interested in an ayurvedic massage course, and thereby we visited several places but they didn’t inspire us trust; because those “Massages centres” were not more than a room without windows, “like a box” or because who taught the course didn’t have theoretical material and charged us a price totally excessive. We were under the impression that they were more talkative than professionals. And according to people told us in Rishikesh there are a lot of them. Also in Rishikesh as in other places of India we found a lot of “alternative” western tourists who with rebellious air use to be dirty, with broken clothes and barefoot walking on the filth. But there are also the other tourists, those that are not actors, those who due to the use of drugs are in very bad condition, like in another dimension, like crazies. Even local people turn back to look at them. I felt sorry for them. We kept cycling toward the south, to Haridwar, it was too hot and humid. And the people drove as mad, sounding horn every time and do not respecting neither anything nor anybody. Like animals. 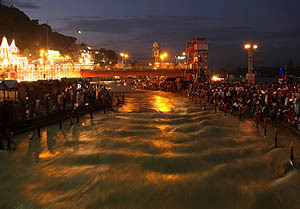 Haridwar has a population of 300.000 hab, but due to it is the most important pilgrimage centre of the state, the city use to be overpopulated. 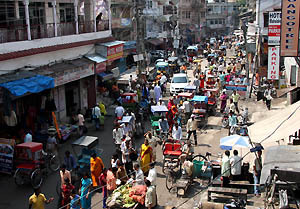 In Haridwar everything was more difficult, to find a hotel, a restaurant, to move by bicycle even by foot. But at least with the sunset we went to the Har-Ki-Pairi ghat where once more we attended to the “Ganga Aarti ceremony” together with thousands of people which like in Rishikesh was a real show.